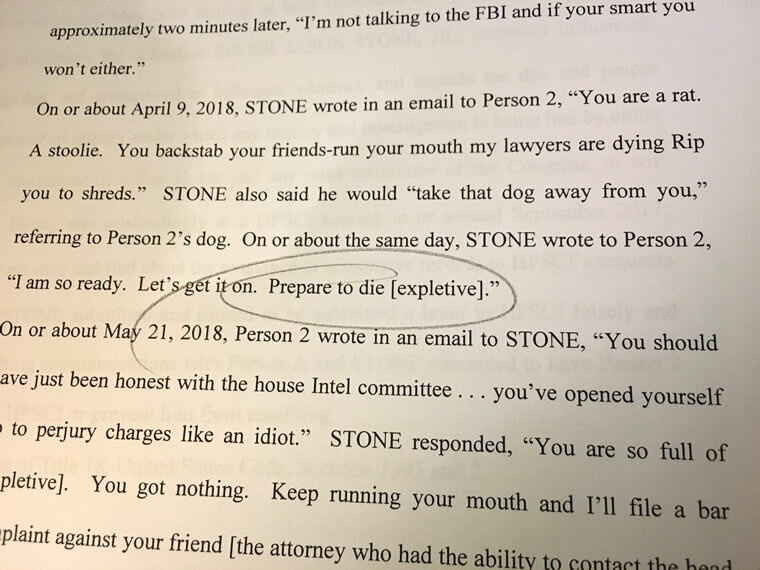 And in that spirit, he was charged Friday with seven felonies, which include witness intimidation (see graphic above), and threatening the life of Randy Credico and his dog Bianca (see inset photo). Meet Bianca, Randy Credico’s canine companion, who Roger Stone threatened to “take.” I don’t think he meant “take and take care of,” as his indictment contains testimony related to The Godfather. Photo via Washington Post video from news photo. Stone was arrested just hours before the government shutdown ended, so I am using one chart (linked here, and posted below), for these two events on this most unusual day in American history. In the second segment, I discuss the astrology leading up to next week’s Aquarius New Moon. This is a challenging sequence events, including Venus square Chiron and Mars square Pluto (described and interpreted in tonight’s Monday Morning edition for our subscribers). In the third segment, I wonder out loud about whatever happened to Dec. 21, 2012, and relate some thoughts from the chart of Dec. 21, 2020 that are more like what we were considering was possible at that much-hyped event. I think it’s beyond absurd that a whole industry arose out of 2012 predictions — books, panels, seminars, workshops and all the rest — and it disappeared like a revival tent, with no astrologer taking credit for their inaccurate predictions. On the program, I reference a few of my works related to 2012, including my PDF book Light Bridge: The 25 Year Span [access free here], which takes events all the way back to the Harmonic Convergence of August 1987. Finally, in Tantra Studio, I clarify what I mean by teaching, which is specifically teaching by example. Knowledge is conveyed many ways, but none so powerful as watching what another person does. One last thought — I mention the Basic Astrology Kit. Here is the letter describing what this includes. Every subscription gets the Basic Astrology Kit and my new book. Planet Waves FM is part of the Pacifica Network, and is published by Chiron Return, a 501(c)(3) nonprofit corporation. Thank you for your ongoing support. You may contribute or become a sustainer at this link. 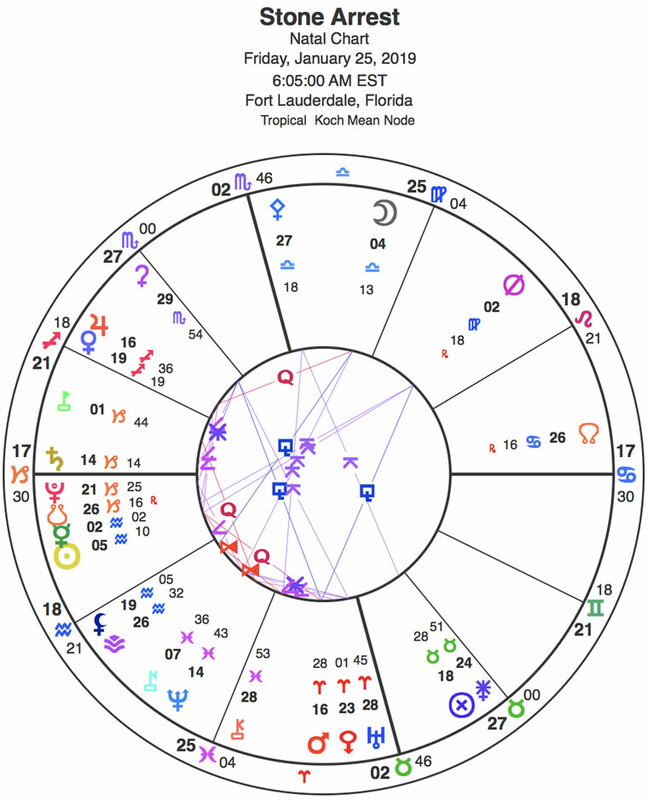 The chart for the arrest of Roger Stone has the Saturn-Pluto conjunction rising, and the Jan. 5 solar eclipse in Capricorn rising. This is the chart I am also using for the end of the government shutdown, as both events are inextricably linked and may be related.